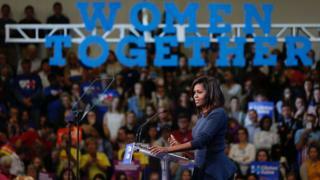 First Lady Michelle Obama has made an impassioned plea about the language permeating the election campaign. While she did not name him by the name, it was clear she was referring to lewd comments made by Republican presidential nominee Donald Trump. Here' s a transcript of part of the speech, delivered in Manchester, New Hampshire. See, on Tuesday, at the White House, we celebrated the International Day of the Girl and Let Girls Learn. And it was a wonderful celebration. It was the last event that I'm going to be doing as First Lady for Let Girls Learn. And I had the pleasure of spending hours talking to some of the most amazing young women you will ever meet, young girls here in the US and all around the world. And we talked about their hopes and their dreams. We talked about their aspirations. See, because many of these girls have faced unthinkable obstacles just to attend school, jeopardising their personal safety, their freedom, risking the rejection of their families and communities. So I thought it would be important to remind these young women how valuable and precious they are. I wanted them to understand that the measure of any society is how it treats its women and girls. And I told them that they deserve to be treated with dignity and respect, and I told them that they should disregard anyone who demeans or devalues them, and that they should make their voices heard in the world. And I walked away feeling so inspired, just like I'm inspired by all the young people here and I was so uplifted by these girls. That was Tuesday. And now, here I am, out on the campaign trail in an election where we have consistently been hearing hurtful, hateful language about women - language that has been painful for so many of us, not just as women, but as parents trying to protect our children and raise them to be caring, respectful adults, and as citizens who think that our nation's leaders should meet basic standards of human decency. This is not something that we can ignore. It's not something we can just sweep under the rug as just another disturbing footnote in a sad election season. Because this was not just a "lewd conversation". This wasn't just locker-room banter. This was a powerful individual speaking freely and openly about sexually predatory behaviour, and actually bragging about kissing and groping women, using language so obscene that many of us were worried about our children hearing it when we turn on the TV. It's that feeling of terror and violation that too many women have felt when someone has grabbed them, or forced himself on them and they've said no but he didn't listen - something that we know happens on college campuses and countless other places every single day. It reminds us of stories we heard from our mothers and grandmothers about how, back in their day, the boss could say and do whatever he pleased to the women in the office, and even though they worked so hard, jumped over every hurdle to prove themselves, it was never enough. But, New Hampshire, be clear. This is not normal. This is not politics as usual. This is disgraceful. It is intolerable. And it doesn't matter what party you belong to - Democrat, Republican, independent - no woman deserves to be treated this way. None of us deserves this kind of abuse. And I know it's a campaign, but this isn't about politics. It's about basic human decency. It's about right and wrong. And we simply cannot endure this, or expose our children to this any longer - not for another minute, and let alone for four years. Now is the time for all of us to stand up and say enough is enough. This has got to stop right now. Because consider this. If all of this is painful to us as grown women, what do you think this is doing to our children? What message are our little girls hearing about who they should look like, how they should act? What lessons are they learning about their value as professionals, as human beings, about their dreams and aspirations? And how is this affecting men and boys in this country? Because I can tell you that the men in my life do not talk about women like this. And I know that my family is not unusual. And to dismiss this as everyday locker-room talk is an insult to decent men everywhere. In fact, someone recently told me a story about their six-year-old son who one day was watching the news- they were watching the news together. And the little boy, out of the blue, said: "I think Hillary Clinton will be president." And his mom said: "Well, why do you say that?" And this little six-year-old said: "Because the other guy called someone a piggy, and you cannot be president if you call someone a piggy." Because let's be very clear. Strong men - men who are truly role models - don't need to put down women to make themselves feel powerful. People who are truly strong lift others up. People who are truly powerful bring others together. And that is what we need in our next president. We need someone who is a uniting force in this country. We need someone who will heal the wounds that divide us, someone who truly cares about us and our children, someone with strength and compassion to lead this country forward.